Roger Federer is getting on in life and at 37 years of age, it will be difficult for the Swiss to compete against Nadal and Djokovic. Rafael Nadal is back on the court and he could not be happier as his return comes on his favourite surface -- the clay court at the Monte Carlo Masters. On his arrival to his favourite hunting ground, Nadal has been told by former tennis star Jordi Arrese that he will break Roger Federer's haul of 20 grand slam titles. Nadal is currently sitting on 17 grand slam victories, only three behind the Swiss maestro who also happens to be a long-time friend of the Spaniard. The two have a storied rivalry on the tennis court and are arguably the greatest ever to wield racquets on a tennis ball. But Arrese believes that Federer's record will not last for too long because age is not on the side of the 37-year-old. The Spaniard is heading into the clay season on the back of a few injuries but is the favourite to capture his 12th Roland Garros title in Paris and his 18th grand slam victory overall. But the Mallorcan native will face a stiff test from world number 1 Novak Djokovic. The Serb has won three successive slams heading into Paris and will pose a formidable challenge for Nadal. "I think Federer will win one more, but there is an age problem and Djokovic and Rafa can win several more," Arrese said. "On clay, Rafa is the best and when he is injury-free and aggressive he can win more. Anyone can end up there [top on the list of most number of grand slams won]." Arrese reckons that he sees Nadal overtake Federer because of his range of quality strokes. "Federer is the favourite because he is the one who holds the most [grand slams]." 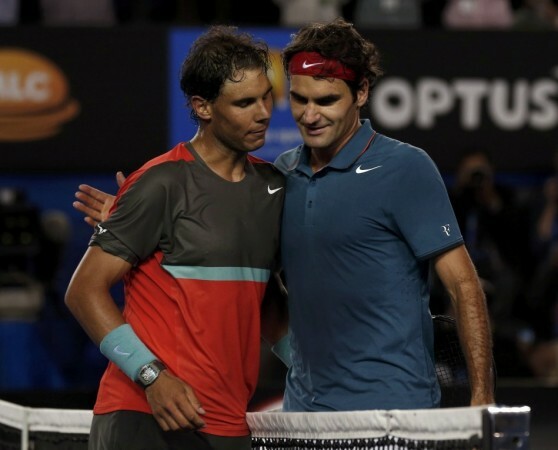 I see it," Arrese said with regards to Nadal toppling Federer's record. "I think that Rafa has the best forehand on tour, he has a very good backhand, he serves much better, hits slice, drops." Nadal will have an opportunity to test out all his strokes when he marches out to his favourite arena in Monaco for the Monte Carlo Masters. This will be Nadal's comeback tournament since withdrawing himself from the Miami Open ahead of the semifinal clash against Federer owing to a troubled right knee. Nadal is set to face Roberto Bautista Agut in his first match and talking about his comeback, the world number 2 said that it was tough. "[I feel] good. This beginning of the season has been a little bit tough for me in terms of problems. I went through some hard times if I'm being honest. This is always tough to accept like what happened in Indian Wells," Nadal said. "But the only way is to keep going, keep trying with passion, even if it is tough to accept, tough to wake up again, stand up again and try. Hopefully, I will start on Wednesday so I have at least four more days to practice." Nadal is the most successful man in the tournament's history, winning the Masters a record 11 times and will be eager to defend his crown heading into the homestretch on the road to Roland Garros.